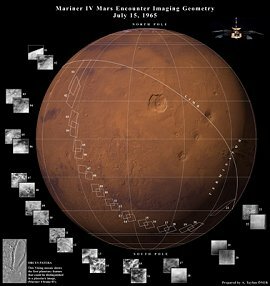 August 23, 2006: When Mariner 4 swooped over Mars on July 14, 1965, it was a moment of high drama. Six other probes had already tried to reach Mars and failed--most malfunctioning before they even left Earth. People had been hearing about life on Mars since the days of H.G. Wells (The War of the Worlds, 1898), and they were ready to see the canals and cities. But the wait was becoming excruciating. The wait was over: With flawless precision, Mariner 4 dipped less than 10,000 km above the planet's surface and took 22 pictures. Mars was covered with desert sand and ancient craters. No cities. No canals. No Martians. No one would ever look at the red planet the same way again. Fast-forward to September 15, 1967. Mariner 4 was cruising the dark emptiness between Earth and Mars. Having shot past Mars in '65 without enough fuel to turn around and go back, there was nothing else to do. All was quiet. Fuel was running low. Soon, Mariner 4 would fade into history. That's when the meteor storm hit. "For about 45 minutes the spacecraft experienced a shower of meteoroids more intense than any Leonid meteor storm we've ever seen on Earth," according to Bill Cooke, the head of NASA's Meteoroid Environment Office in Huntsville, AL. The impacts ripped away bits of insulation and temporarily changed the craft's orientation in space. "It was a complete surprise." Think about it. Out in the "emptiness" between Earth and Mars, a region of space astronauts are going cross one day if NASA's Vision for Space Exploration comes to fruition, lurks a dark stream of meteoroids capable of producing a shower more intense than anything we've seen in centuries of sky watching on Earth. "Until Mariner 4 stumbled onto it," says Cooke, "we had no idea it was there." For almost 40 years the source of the shower remained a mystery. But now, meteor expert Paul Wiegert of the University of Western Ontario may have cracked the case. The culprit, he believes, is a "dark comet" named D/1895 Q1 (Swift) or "D/Swift" for short. "Comet D/Swift was first seen in August 1895 by the prolific comet hunter Lewis A. Swift," says Wiegert. Swift discovered or co-discovered more than a dozen comets, including 109P/Swift-Tuttle, the source of the well-known Perseid meteor shower. Unlike his other comets, however, "D/Swift quickly vanished. The comet was last spotted in February 1896 heading out of the inner Solar System, and it has never been seen since, even though its orbit indicates it should come back and brighten every 5 years or so." What happened to D/Swift? "The comet may have disintegrated," says Wiegert. 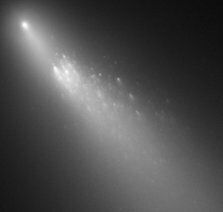 Comets are notoriously fragile and sometimes a little sunlight is all it takes to make them crumble. Comet D/Swift probably overheated when it passed by the sun in 1895 and later fell apart. D/Swift was mostly forgotten until last year when Bill Cooke wondered if "some old D/ comet" might be responsible for the Mariner 4 episode. Comets, especially disrupted comets, leave a stream of debris in their wake as they orbit the sun. If Mariner 4 passed through such a stream, "it would have been sandblasted." He asked Wiegert, a friend and colleague, to look into it. Wiegert began to examine old comet data and—voilà—"Mariner 4 was close to the orbit of Comet D/Swift at the time of the meteor encounter." Amazingly, Mariner 4 was not merely close to the comet's orbit, it may have been close to the comet itself. "According to our calculations, the [possibly shattered] nucleus of D/Swift was only 20 million kilometers from the spacecraft." As distances go in the solar system, that's nearby. "It's like in Star Trek when Enterprise stumbles across a comet in the middle of deep space. Of course, that's crazy," says Cooke. "Space is so big, the chances of running across a comet are almost nil." Yet this may be what happened to Mariner 4. Mariner's cameras weren't turned on at the time, so a comet could've passed by unnoticed—except for the jostling of comet dust. Telescopes on Earth saw nothing, but that's no surprise. An old, shattered nucleus wouldn't necessarily glow. It all makes sense. Wiegert still has doubts. "The complicating factor is that, because D/Swift was seen for only a short time in 1895-96, its orbit is not terribly well-known. Our extrapolations could be wrong. We're in the process of collecting more observations from 19th century archives and re-analyzing them. Soon, I hope there will be enough information to convict or acquit Comet D/Swift." This investigation may lead to others. "The space between Earth and Mars is probably criss-crossed by old debris streams," says Cooke. Wiegert's methods can be used to find some of them, "so the next meteor storm won't be such a surprise." So Much for Fame! -- the story of comet hunter Lewis A. Swift. D/1895 Q1 (Swift) -- To view the comet's 3D orbit and other data, type "1895 Q1" in the search box and hit ENTER. A historical log of missions to Mars.